Insider Monkey finished processing more than 700 13F filings made by hedge funds and prominent investors. These filings show these funds’ portfolio positions as of September 30th. What do these smart investors think about Newmont Mining Corp (NYSE:NEM)? Starting our analysis of the stock with the recent hedge funds sentiment – Newmont Mining Corp (NYSE:NEM) investors should pay attention to a decrease in the number of smart money investors with long positions. At the end of the third quarter, the stock was in 26 hedge fund portfolios, which is down by two from the previous quarter. The company wasn’t one of the 30 most popular stocks among hedge funds. In spite of Gabelli Value 25 Fund’s optimistic forecast, we are still not convinced, which is why we are going to examine the stock furthermore. How are hedge funds trading Newmont Mining Corp (NYSE:NEM)? Heading into the fourth quarter of 2018, a total of 26 of the hedge funds tracked by Insider Monkey held long positions in this stock, a drop of 7% from the second quarter of 2018. 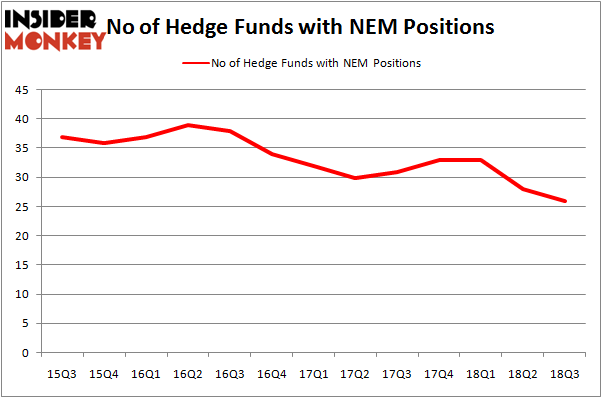 Below, you can check out the change in hedge fund sentiment towards NEM over the last 13 quarters. So, let’s check out which hedge funds were among the top holders of the stock and which hedge funds were making big moves. Among these funds, AQR Capital Management held the most valuable stake in Newmont Mining Corp (NYSE:NEM), which was worth $126.1 million at the end of the third quarter. On the second spot was D E Shaw which amassed $86.8 million worth of shares. Moreover, Two Sigma Advisors, Millennium Management, and Citadel Investment Group were also bullish on Newmont Mining Corp (NYSE:NEM), allocating a large percentage of their portfolios to this stock. Because Newmont Mining Corp (NYSE:NEM) has faced a decline in interest from the smart money, logic holds that there exists a select few hedge funds who were dropping their entire stakes by the end of the third quarter. Intriguingly, Scott Bessent’s Key Square Capital Management sold off the biggest position of the “upper crust” of funds tracked by Insider Monkey, comprising an estimated $36.6 million in call options. Michael Platt and William Reeves’s fund, BlueCrest Capital Mgmt., also dumped its call options, about $28.3 million worth. These transactions are interesting, as total hedge fund interest dropped by 2 funds by the end of the third quarter. Let’s now take a look at hedge fund activity in other stocks – not necessarily in the same industry as Newmont Mining Corp (NYSE:NEM) but similarly valued. These stocks are Franklin Resources, Inc. (NYSE:BEN), Match Group, Inc. (NASDAQ:MTCH), WellCare Health Plans, Inc. (NYSE:WCG), and D.R. Horton, Inc. (NYSE:DHI). This group of stocks’ market caps resemble NEM’s market cap. As you can see these stocks had an average of 36 hedge funds with bullish positions and the average amount invested in these stocks was $1.40 billion. That figure was $448 million in NEM’s case. D.R. Horton, Inc. (NYSE:DHI) is the most popular stock in this table. On the other hand Franklin Resources, Inc. (NYSE:BEN) is the least popular one with only 29 bullish hedge fund positions. Compared to these stocks Newmont Mining Corp (NYSE:NEM) is even less popular than BEN. Considering that hedge funds aren’t fond of this stock in relation to other companies analyzed in this article, it may be a good idea to analyze it in detail and understand why the smart money isn’t behind this stock. This isn’t necessarily bad news. Although it is possible that hedge funds may think the stock is overpriced and view the stock as a short candidate, they may not be very familiar with the bullish thesis. In either case more research is warranted. Is Mattel, Inc. (NASDAQ:MAT) A Good Stock To Buy? Here is What Hedge Funds Think About Las Vegas Sands Corp. (NYSE:LVS) Hedge Fund Sentiment Is Stagnant On Boston Beer Co Inc (NYSE:SAM) Is Pure Storage, Inc. (NYSE:PSTG) A Good Stock To Buy? Hedge Funds Aren’t Crazy About Meritage Homes Corp (NYSE:MTH) Anymore Do Hedge Funds Love Catchmark Timber Trust Inc (NYSE:CTT)?